I am excited to introduce the School Counselor Survival Kit! These items will help you start your career as a school counselor, whether you are a school counseling intern and have to schlep your stuff around a school or a new school counselor trying to fill an office. 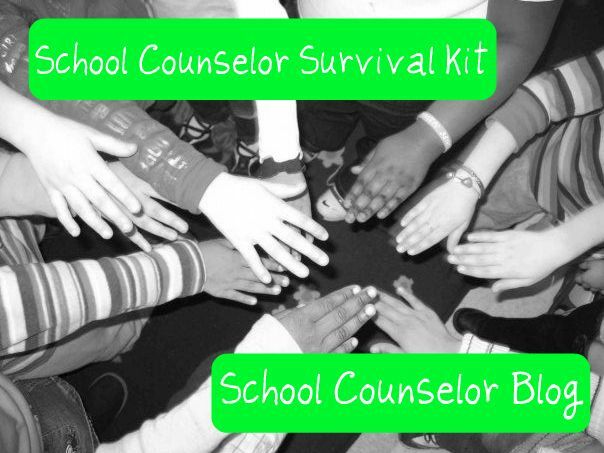 The School Counselor Survival Kit will get you started on your journey. Cart on Wheels - a cart on wheels such as the Rubbermaid Collapsible Cargo Crate can make getting from place to place a breeze. I highly recommend this, especially for internships! I still use mine all the time to lug my stuff in and out of school. I wrote a previous post about the collapsible cargo cart. Art supplies - You don't need to have a ton of art supplies, but I do recommend you have the basics, including crayons , colored pencils , markers , paper (lined , unlined , and construction paper ). I recommend Crayola brand , especially the twistable crayons and colored pencils . You don't need a sharpener, you just twist them! Play-Doh - Play-doh party packs are great for groups and individual sessions. I like to give kids their own play-doh so they can take it home after group. For my internships I purchased the Play-Doh duffel bag. I still have it and it gets a lot of use in my office. I wrote a post about getting discounts on play-doh after the holidays and ideas for using play-doh in counseling. Stress Balls - Stress balls are helpful for teaching students about managing anger. You can get stress balls at many places for free. I have stress balls in the shape of everything from an atm to a plane. I got most of my stress balls from exhibit areas at conferences. Stress Ball Making Supplies - If you don't mind getting a little messy, students LOVE making their own stress balls. All you need is all purpose flour, balloons , scissors , and a funnel . For instructions check out my post, creating a stress ball. You can also use a pool noodle to create a stress ball. Bubbles - Children and adults alike LOVE bubbles . They are great to use for teaching relaxation techniques and to help students calm down. I wrote a previous post with ideas of how to use bubbles in counseling with students. Puppets - Finger Puppets are a great addition to your survival kit. Finger puppets are small so you can fit lots of them in your kit. Students love to act out situations or just play with the finger puppets. 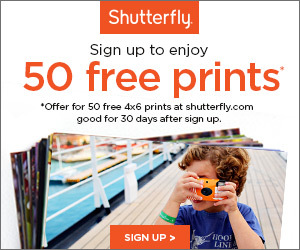 I have found great deals on finger puppets at Amazon, Ikea, Target, eBay, and Ten Thousand Villages. Jenga - Jenga makes a great addition to a school counseling survival kit. There are many ways you can use Jenga in counseling. You can have each student ask a question as they pull out a block. It is great to talk about patience and frustration. With a colorful version of this game, you can have students pick emotions/feelings to represent each color. You can then have students talking about a time they experienced that feeling or how they could cope with that feeling when they pull the particular color. Uno - Uno is a fun game to play with students the original way, or it can be about feelings and experiences. Allow students to pick feelings or rules for each color. Each time a someone lays down a color, they can talk about that feeling or experience. Portable Sandtray - One of the most used items in my office is my portable sandtray. I actually did not have this during my internships and wish I would have. It is great and inexpensive to make. My friend and fellow school counselor, Shelly Blair, wrote a guest blog post about creating a portable sandtray. Plastic Tube Animals - Plastic tube animals work great in a portable sandtray or by themselves. I recommend getting dinosaurs and jungle or zoo animals to start your collection. *Other places to get plastic tube animals includes: craft stores such as Michael's, Ross/T.J.Maxx/Marshalls, and department stores, and Amazon . Army People - Army people are a great addition to your school counseling survival kit, especially if you create a portable sandtray. Students play out scenarios and conflict using army people. They are super cheap and you can even find them a the dollar store! Animal Crackers - Animal crackers make a great icebreaker! I have used animal crackers in groups for new students and as ice breakers in other groups. I have students pick an animal and identify how they are like that animal. It is a fun and tasty way to for students to get to know each other. Check out my previous post about animal crackers. Basketball Hoop - An Over-the-door basketball hoop is a necessity! It is great because you can put it up wherever you go. Boys and girls alike love to use my basketball hoop. I use it in sessions with students. Sometimes we play a game where we answer a question then make a shot. Other times, students just talk to me about what is going on for them while shooting the basketball. Balloons - Balloons have a variety of uses. Balloons can be used to make stress balls (with sand or flour), teaching students how to calm down, and even remembering a loved ones through a balloon release. Tissues - Nothing is worse than searching for tissues when a student requests one. I like to keep tissues in my school counseling survival kit just in case. All of the items mentioned in the School Counselor Survival Kit will help you on your journey of becoming a school counselor! You do not need all of these items at once. The great thing about these items is that the majority of them are multifunctional - you can use them for more than one activity. 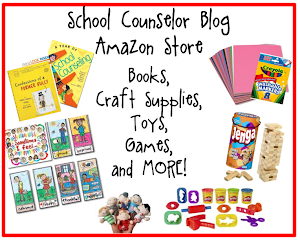 I created a Amazon Listmania List of the items included in the School Counselor Survival Kit . I will be updating theSchool Counselor Survival Kit as I think of more ideas and places to buy items. 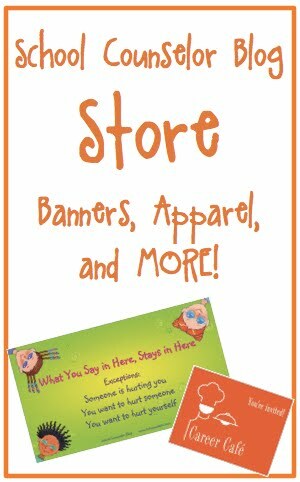 I am always on the lookout for great items to share with other school counselors! The "page tab" on School Counselor Blog called "School Counselor Survival Kit," allows you to easily access this information as it is updated. Also check out my Amazon Listmania List of Elementary Level books to include in your survival kit! What items do you have in your "School Counselor Survival Kit?" 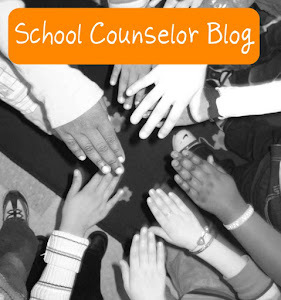 Email me, tweet, or share on the School Counselor Blog Facebook Page! Danielle is a K-12 Certified School Counselor, Nationally Certified Counselor, and blogger at School Counselor Blog, a blog where school counselors can share innovative ideas, creative lesson plans, and quality resources. Contact Danielle via email, follow her on twitter, and become a fan of the School Counselor Blog Facebook Page. Latex is banned in our school, due to allergies. Any ideas for latex free ways to make stress balls? I have made students stress relievers using a pool noodle: http://www.schcounselor.com/2010/07/fabulous-find-friday-pool-noodle.html. I also give students mini play-doh packs to use in my office or to take home with them: http://www.schcounselor.com/2010/10/seasonal-find-halloween-play-doh.html.